Leader in the design and production of green roof media. We get a lot of questions from students and beginners on how green roofs work, and we’ve developed a series of videos to help you learn the basics of green roofs. With over 10 years of experience, Skyland USA has provided soil for more than 11 million square feet of rooftops and is proud to provide consistent, high-quality, cost-effective solutions for greening our cities. In fact, today Skyland USA is still the ONLY company in the U.S. that focuses exclusively on green roof media. With two product lines, rooflite, high-quality green roof media, and Terramenta, a planter performance system, Skyland USA has you covered for any of your green roof or on-structure soil needs. 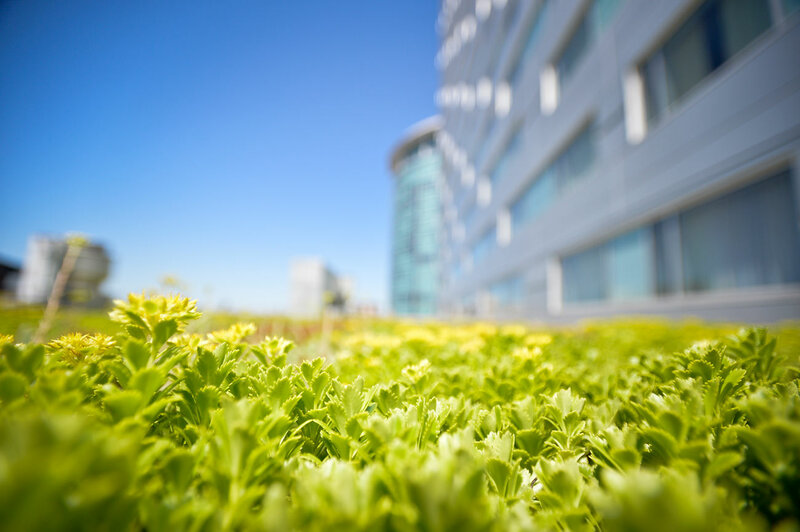 Green roofs differ from a natural environment as they are on top of a building and are not connected to the natural ground. rooflite® Certified Green Roof Media is lightweight and performance characteristics have been optimally engineered for this unique environment. Terramenta is a multi layer engineered soil profile which ensures long term healthy plant growth. Terramenta is for professionals who design, specify, or install container gardens or larger planters for long-term plantings in outdoor environments. When Skyland USA launched, the U.S. green roof industry was in its infancy. The company quickly became the preferred green roof media provider in the U.S.
Skyland USA is committed to providing top-notch customer service at every step of your green project from growth media estimating, purchase and delivery. Your project success matters to us, and we do everything we can to make the process smooth & easy. Skyland USA provides a variety of packaging and delivery options, just-in-time logistics, and continuous monitoring of your project through completion. We'd love to hear from you! Contact us today to find out more about Skyland USA and how our soil products can make your project a success.